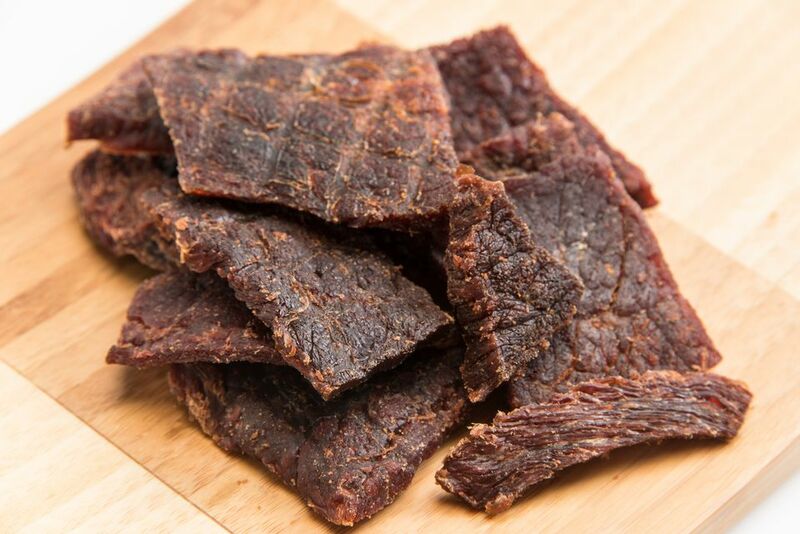 This basic method for jerky will work with just about any type of meat using the dehydrator or oven. Freeze meat until firm, but not hard. Then cut into 1/8- to 1/4-inch thick slices. In a medium-size glass, stoneware, plastic or stainless steel bowl, combine soy sauce, Worcestershire sauce, onion powder, pepper, garlic powder, and liquid smoke. Stir to dissolve seasonings. Add meat and mix until all surfaces are thoroughly coated. Cover tightly and refrigerate for at least 6 hours or until next day, stirring occasionally; recover tightly after stirring. When ready to dehydrate the meat, there are two methods that you can use: the dehydrator method and the oven method. Evenly coat the dehydrator racks with cooking spray. Lift meat from bowl, shaking off any excess liquid. Arrange meat strips close together, but not overlapping. Arrange trays according to manufacturer's directions and dry at 140 F until a piece of jerky cracks, but does not break, when bent (8 to 10 hours). Place racks over rimmed baking pans. Evenly coat metal racks with cooking spray. Lift meat from the bowl, shaking off any excess liquid. Arrange meat strips close together, but not overlapping, on racks. Dry in the oven on lowest possible setting until pliable, but dry (about 8 to 10 hours). Let jerky cool for 5 minutes before testing. Pat off any beads of oil from jerky. Let cool completely on racks. Remove from racks, place in a rigid freezer container and freeze for 72 hours. Then store in an airtight, insect-proof container in a cool, dry place. Can store up to 3 weeks at room temperature. Can store up to 4 months in the refrigerator. Can store up to 8 months in the freezer.